I don't know about you, but I have never eaten barley other than in Campbell's beef and barley soup (which I always liked as a kid). I don't really eat canned soup anymore because it is mostly wretched and the sodium content is enough to choke a horse. After seeing several recipes and reading about it's nutritional value, I decided to give it a try. I've decided~ like it. Barley is one of the oldest domesticated grain crops. It has been cultivated for over 8000 years. In Athens barley was, according to Pliny, the special food of the gladiators (the hordearii, or 'barley-eaters'). Historians report that up until the 16th century, it was the most important grain on the European continent. It was also used as currency and as a measuring standard. 1. It is really yummy. It can be served plain as a side dish, as a tasty pilaf or in soup! 2. It's good for you. Packed with nutrition, barley is a very good source of fiber and selenium, and a good source of phosphorus, copper and manganese. 4. It can lower cholesterol. 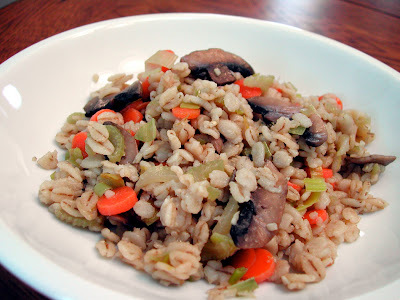 Ditch the oatmeal tomorrow morning and have barley for dinner! In medium saucepan, bring chicken broth to a boil. Stir in barley; reduce heat. Cover; simmer 10-12 minutes or until tender. In large skillet, heat oil. Cook leeks, carrots, celery and mushrooms over medium high heat 4-5 minutes. Add garlic; continue cooking 1 minute. Add cooked barley and soy sauce; mix well. Continue cooking over medium heat until heated through. I don't think I've ever had barley, but this sounds good.